Chris Peterson: So, here we are in the Mississippi Entomological Museum. What exactly is it that you do here? 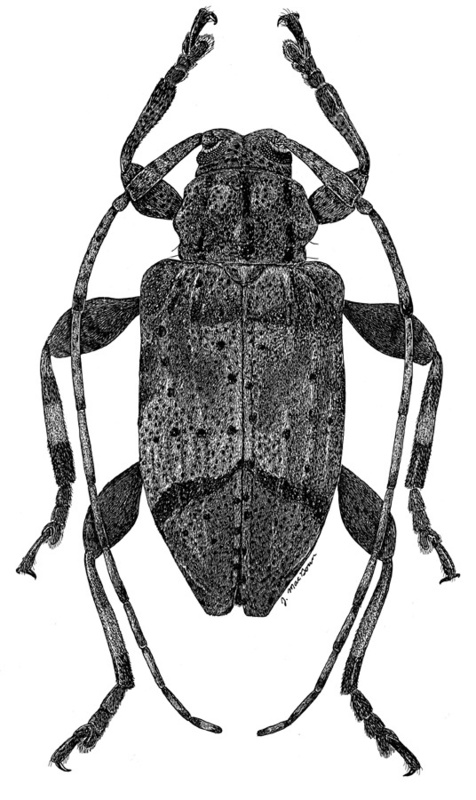 Joe MacGown: Well, obviously, one of my duties is to do illustrations of insects. That encompasses a lot of things: drawings, paintings, photography, and digital manipulations of things I've done by using image software programs, such as Adobe Photoshop or Illustrator. I put together posters, talks, plates of images for books and journal articles, do designs for tshirts, and other similar things. I routinely teach graduate students how to do scientific illustrations, digital microscopy, and how to use graphics software. Originally, I started out doing more illustrations, but over the course of the twenty years that I have worked here, the job has changed a lot as I've learned more about the study of insects. As a result, I've gotten more into research during the last few years. I've done a lot of work with native and exotic ants of the southeastern United States. I curate several parts of the collection, including the scarab, ant, and mosquito groups. I also am the Webmaster for the museum web site (http://www.mississippientomologicalmuseum.org.msstate.edu/ ). CP: What first, pardon the pun, drew you to illustration? JM: As far as scientific illustration? CP: Either way. We'll get to your artistic stuff later on. JM: I started doing scientific illustrations when I started working here. That was part of the job and something that was needed. I already knew how to draw, and had done similar styles of drawing with ink for years beforehand. The reason I was initially hired was that I could draw. I didn't really know a lot about scientific illustration before that. CP: So you have no formal training in scientific illustration? JM: Oh no. It';s mostly on the job training. I looked at the things other people have done, tried different techniques, that sort of thing. Some of the early drawings I did I didn't like at all. I would go home and work on them, and I'd redo some initial drawings five times. I'd try different media. I didn't’t know if I wanted to do graphite, carbon dust, ink, or other techniques. CP: Is there an overall difference in the end product based on the media that you use? JM: Yes. If you use a method like carbon dust, for example, the end product would look quite different than an ink drawing. Are you familiar with carbon dust? JM: It's much like graphite, but it's much more permanent. It's a way of brushing fine carbon dust onto paper in a layered manner that gives a polished effect when you’re done. It's really nice. For some subject matter it is very effective, but for other things it might not portray the insect in the desired way. Ink drawings look totally different, are a lot more permanent, and easier to reproduce. CP: Is carbon dust harder to do than ink? JM: I wouldn't say it's harder, it's just different. It's quicker, even, but a little messier. The trade off is that ink is more versatile. You can photocopy it, you can scan it, and use it a lot of ways. CP: So ink is the best for reproducing? JM: It's the cheapest and easiest to reproduce. CP: That leads me to another question here, which you hinted at. Are there different styles of scientific illustration? I know there are different media that you can use, ink, carbon dust, and your web site mentions a scratch board . But are there different styles? Painting has impressionism, and cubism, and all that. Or is scientific illustration pretty much the same across the board? JM: Of course there are different media. But the styles also differ. With ink, one person may use a lot of stippling, while another uses a lot of cross-hatching. Some people may have a minimal usage of ink. He may just do a small amount of ink to save time. Someone else may be applying it liberally. It depends on the person. Some people even use a brush to do stippling. CP: Now what exactly is stippling? JM: Oh, stippling is one method of applying ink to produce tones. It's using small dots of ink to build up layers, which is rather time consuming. JM: Oh. Cross-hatching. Or hatching. Hatching is simply the application of fine parallel lines to fill in areas of value in a drawing. Crosshatching involves overlapping those parallel lines with more lines applied in a different direction. The more layers you apply, the darker the tone becomes. CP: So under a magnifying glass it will look like a checkerboard. JM: Essentially. So you can add tones by either stippling or hatching. Some people are purists and they only do stippling or hatching. I'm not. I use whatever fits the bill. I don't want to spend three weeks stippling a picture this big [7x 9 inches]. So I use a combination of cross-hatching and stippling. Or I may fill in areas that are dark with thicker pens or brushes. CP: So you were an artist before you got into scientific illustration. CP: What does your artistic experience bring to scientific illustration, and vice versa? Does one help the other, or are they such different styles that they're really different? 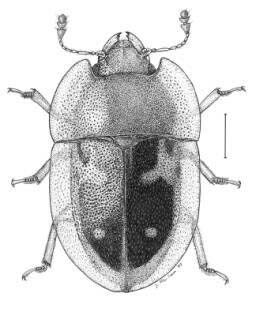 JM: General knowledge and skills in drawing anything will apply to any other subject matter, so knowing about shading and just being able to draw, crosses over into the field of scientific illustration. I did, and still do, a variety of work. I don't only do fantasy work in my free time. I've done old houses and barns. I used to draw a lot of animals and wildlife; that was pretty realistic. It's just that you're not using a microscope. But actually applying the ink or whatever media you’re using, it's all the same. CP: Between the scientific and artistic? JM: Yeah. As far as how the scientific illustration helps my other art - I'm looking under the scope and seeing things that most people never see. I'm seeing really weird stuff. Of course, I don't think it's as weird anymore because I see it everyday. I can apply that to the surreal type drawing I do. I see that as subject matter. I do it all the time. CP: Yeah. On your web site, you describe yourself as a "neo-gothic surrealist." What exactly does that mean? JM: Well, you've got to have a cool name to describe yourself. Really, the style of drawing I do, especially the ink drawings, reminds me of the stuff they were doing in the Middle Ages; in the gothic period during the twelve to fifteen hundreds. Also, as I got older and started looking at some art history books, I realized that some of the artists from that period did some really fantastic drawings. They wouldn't have called it surrealism, because they really believed in what they were doing in a religious way. They were drawing their personal representations of demons or things that they did not understand. JM: Yes, or simply by their beliefs at the time. Hieronymus Bosch, are you familiar with him? CP: I've heard the name. JM: He did some crazy things and weird creatures and stuff. But he wasn't doing them to be weird; they were religious ideas in his head. Real surrealism didn't start until the mid-1900s. Surrealism is basically just subconscious imagery you are putting out in a realistic fashion, with weird juxtapositions of things. But the reason I call myself a neogothic surrealist is that I'm producing artwork in a style reminiscent of artwork produced in the Middle Ages. Because the themes of my drawings are more modern and not of a religious nature, and because my style is also more modern (but still similar) than traditional gothic drawings, I consider my artwork to be a newer form of gothic fantastical expression, hence the term "neo-gothic surrealism". CP: Who are your influences? Whose book is sitting on your coffee table that when you get stuck you go to and look at for ideas? JM: I don't really get stuck in that way. I've been drawing weird stuff since I was old enough to hold something. So that's not a new thing. I didn't look at art books when I was a kid, I didn't know much about other artwork. It was self-developed. As I got older, I started looking at Rembrandt's etchings. I really liked the way he used light and dark in his etchings, not his paintings. And I also studied artists such as Hieronymus Bosch, Albrecht Durer and M.C. Escher. Recently, I just started looking at more surreal art. Surprisingly, I never really studied it, and maybe my style is a little more different consequently. These days, I'm more motivated by artists that I've met through various web sites. I have actually had the opportunity to do collaborative work with some of these artists. That really motivates you to do more. CP: The Internet has really opened up a lot of artists being able to communicate with one another. JM: And not only in a web-based way. We mail things back and forth. To other countries, wherever. So that's been very useful. You get to see other people's artwork and get to keep some of it, and they get some of yours. It's a really good deal, a great mixing of ideas. Some of the people are famous. You are working with people who are unbelievable. It's really exciting. CP: So where do you get your ideas? 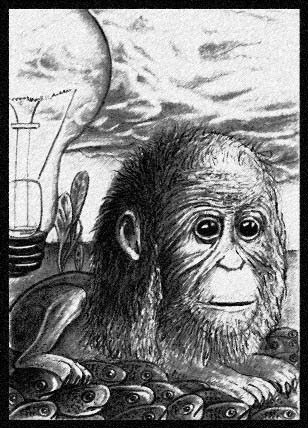 Do you set out on your surrealism stuff… Like right now on your screensaver, I see a monkey with a lion's body with what looks like feathers for a tail and a light bulb, a bunch of fish. Do you set out do that type of stuff, or do you just start on the page and go until you are done? JM: It really depends. I do drawings in two different ways. Sometimes I have an idea in my head for an overall composition. But then a lot of the time I have no idea where it's going. I just let things randomly flow out. I look for shapes in things, like some people look for shapes in clouds. I can see shapes in everything. Everywhere I look I see weird stuff. So it really doesn't matter. I don't have this problem where I have to be in a mood to draw or paint. I'm always in the mood. I draw everyday. When I get home at night I draw or paint; every weekend, every day. So I don't need to be inspired. As soon as I start drawing, things start developing. And if I see or draw something, anything, even one shape, I can then draw something that connects to it, and just go on and see where it takes me. Sometimes it's like a story, or like life, unfolding in front of your eyes. CP: It could start out one thing and ends up another. JM: But then, other times, I do have a theme. For example this tree over here [points to picture on wall]. I wanted to draw a certain shaped tree and from there it really didn't matter. I started with a really general idea at best. There is a lot of entomology in some of the drawings. CP: And that's where I can see how looking through the microscope all day translates into drawings. JM: Even some of the abstract stuff comes from stuff I see in the microscope. CP: [Points to a picture on the screen] Those look like gills from an aquatic nymph or something. JM: Looking around in nature and under the scope. That's more recent. I drew this picture here [points to large picture over desk] before I started working here. That's an old picture. About the year I started working here I was working on that at the time, and it had some insect features already in it. That drawing took a few months. I did have some early indoctrination in entomology because my father was an entomologist. He got his Ph.D. here. He did illustrations of his own, although we didn't interconnect with those. He didn't show me how to draw, as he had his own thing going on. Ironically, I later started working here doing very similar work that he had done. CP: Maybe it's in your genes. JM: I don't know. His mother [my grandmother] was an artist too, as is his brother and sister. CP: So you said you were pretty young when you started drawing strange stuff. How young? Four? Five? JM: Yeah. I can remember even at four taking everyday images like trying to draw a coffee cup and putting faces in the handle. Any kind of shape. I liked to do pages full of shapes, and I'd change them. CP: I'll bet that led to a lot of meetings with the principal and your parents. JM: I was lucky in school in that I did well. They always, I think because I made good grades, let me draw. I never had a problem with that. To the point of it being ridiculous at times. In fact, I always felt like I did better in the classes where I drew more. I could soak the information in better if I was preoccupied with drawing. CP: They let you break the big rules if you follow the little ones. JM: Pretty much, right. I had a lot of success getting away with drawing in class. Everything I turned in had drawings on it. CP: So for scientific illustration, you never even considered that as a profession? JM: I did briefly think about it before this job. I went to school in art for one year at Memphis Academy of Art. I only went a year. I already had a style; I didn't feel like the classes I was taking were taking me in the directions that I wanted to go. And, I talked to some illustrators, medical illustrators, and they actually suggested I not go into the field. They said it was going nowhere; it was being taken over by photography. They didn't recommend it as something to do for a living. I was a little bit disappointed, because I liked that type of drawing. I've always thought it was neat. CP: So do you agree that scientific illustration is going the way of photography, and illustrators are going to fade, or do you think that there is still a place for illustrators? 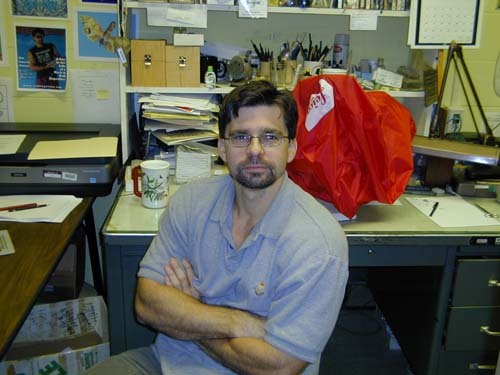 JM: Yeah, because I am coming from a different viewpoint now, also as a researcher. I find some illustrations are much more useful to me than a photograph. You can show specific things. You can highlight certain areas. A lot of times I'm working with specimens, maybe there's not many specimens. Maybe the legs aren't where I want them. I've got to move things around, I've got to show things in a position where everyone can see what needs to be seen. I think it's really important, especially the most simple drawings, which to me, are the most useful. Also, a photograph is really misleading because it's just so real looking. You think that it represents what is typical and all specimens of that species should look exactly like that because it's "real." When you see a drawing, your apt to say "well, because it's a drawing, it may give a broader idea of what the species should look like." If you look at one photograph and you have a specimen in front of you and it's a slightly different color, you go, "well, it must be different." But on the other hand, things are changing, and sometimes a photograph shows what you want to see better. I think that by using a combination of drawing, photography, and computer graphics, we now have many more options for illustration. 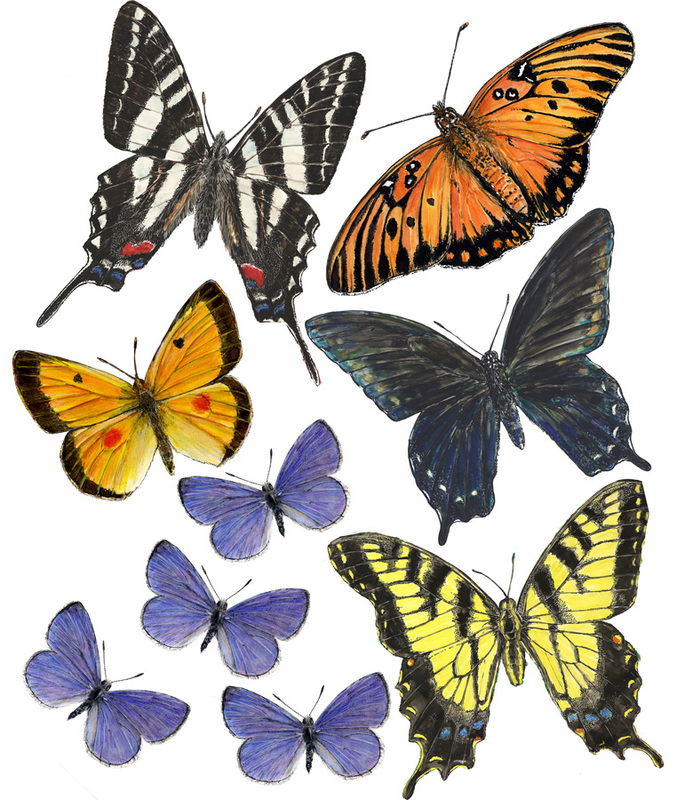 CP: How much harder is it to use color in scientific illustrations? Because if you look at a lot of these pictures, a lot of people say that scientific illustrations are boring. It's just a bug sitting there by itself. JM: As for as boring, I mean, sure, to the person who doesn't know anything about them, they will get nothing out of them. They're not for art. I wouldn't call that art. It's only to help aid people investigating the group. They're usually done, like my scarab drawings, or whatever beetle drawings I've done for various things, they're all done in the same way, the same lighting, the legs are laid out in the same way. It's for comparative reasons, so it's easier to compare similar species. They may be a little bland, but I find that type of artwork not to be bland. I like it. But I can see how some people wouldn't. But as far as color, there's nothing wrong with doing color. CP: Is it harder as an artist? JM: It's a lot quicker to do the color work. When I do color with paintings, it takes me a fraction of the time. CP: Really? Why is that? JM: Ink, little pens, you're building up stipples and lines. It just takes time to fill areas. With paint, you can apply pigment to a large area really quickly. It just doesn't take long. Paintings are good. Colors are good. The problem has always been that reproduction is expensive. Most people can't afford it in their budgets. If they can get a good photograph they may want to shoot a photograph rather than hiring an illustrator. The painting may be better. It may actually show certain characters in a more clear way. It's just like a drawing. You can accentuate certain features with a painting. Now, with a photograph, you can do that to some degree with graphics programs. I can take a photograph, and if the legs aren't in the right place I can move them around, I can take different pictures and add them on. In my opinion, that's still illustration. So that's where illustration is going. You still need to be able to do simple drawings, pen drawings, paintings, whatever else you need to do, take photographs, then you need to be able to manipulate them in any way you can with graphics programs. We need to be able to arrange things on plates, take out problem areas, fix things, whatever. So it's kind of gone that way. There's still some need of the other, but there's also other things, other technologies, such as SEMs and digital camera systems, that give us many more ways of producing illustrations. We have a camera system that stacks images at different focus levels, and then the associated software puts the multiple images together into a composite image. But you still have to do something with it. The images aren't perfect, so some extra digital manipulation can really improve the images. Even photography, in a sense, can be said to be a form of illustration. That's how it's different now. CP: Why don’t they put more insects in life-like poses? Show them on plants, show them actually in life behaviors? Why has that really not taken off as a scientific illustration form? JM: Some people do. You do see some of that, certainly not as a norm, but there is plenty of that out there, especially on web sites. But I guess the main reason would be is that it's hard to draw insects in life like settings. Even the photographs of nature are not as good usually, unless they are of big insects. Insects are so small. It's hard to draw them in their natural state. That's not always the best way to view the insect for comparison or for study. There are certain important characters that need to be seen. You need to be able to count tarsal segments, or maybe, like certain ants, you need to be able to count the mandibular teeth. You have to measure lengths, etc. So it's important that you portray them in a way that’s measurable. I think that's the biggest reason. I think it's nice to see some in natural settings though, it helps better understand the organism. CP: Do you ever run into trouble, do artists ever struggle trying to be scientific illustrators, and vice versa? Do you ever find yourself limited in what you can do trying to do two things? JM: When I do insect illustrations, I am definitely limited in that I can't use the creativity I would use in my other types of drawings. But because I have that outlet it's not really a problem. It's just something I do at work. I don't really have a problem with that. You can still be creative in your technique, in the way you choose to portray something. CP: You mean using the stippling versus the cross-thatch? Where does the creativity come in? JM: Even within those boundaries, people will use ink a different way. You can tell one person's drawings from another's, usually. Maybe they use thicker pens, maybe they have a better feel for portraying insects, or maybe they can make something look more rounded than another person. You can have pride in how you show your artwork and make it look more realistic, or how you choose to create it. I don't want to make my drawings look just like photographs. That's not my goal. CP: Suppose I'm a starving artist, and I don't want to starve anymore, and I'm looking at scientific illustration as a way to earn a living. What would you tell me about what I need to know, what I need to be prepared for, that sort of thing? Somebody comes up to you and says "Hey! I want to do what you do." What would you tell them? JM: Well, you have to have a combination of skills. First of all, you have to be able to draw, and understand a variety of media. You need to have some knowledge of photography. You need to be able to use a microscope. You need to have a good knowledge, nowadays, of current software, graphics software. You have to know how to use the different tools. It really helps if you have some scientific background. In my case, I learned it while working here. You have to be able to get along well with scientists, back and forth. They are going to be telling you what you need to see. You may not agree with what they see. Maybe you argue with them. "Well, I see this when I look." And maybe you see something they don't see, but they may want to portray something a certain way. You've got to be able to deal with people and be able to take criticism. It may not be that you are doing a bad drawing, but they want it shown in a certain way. Remember, you are typically doing illustrations for someone else. In my case, that's not always true now, because I'm doing stuff for myself as well. It's a little different. But if I do something for Dr. Brown, maybe some moth genitalia, we're going to be back and forth. I'm going to do a preliminary drawing, he's going to come in here, and he's going to look at it and we're going to go back and forth. That's how you do it. You do that with anybody. CP: We probably covered this some earlier, but you disagree with those that said that scientific illustration is a dying field. JM: Well, that was 25 years ago. I would say it's stronger today that it was then, and more, because of the digital technology we have, and also the microscopes are way better now. You can go in and see things you couldn't see 100 years ago. You read early descriptions, and they describe something and then you go look at it today, and realize that they just couldn't see some things we can today. So we can show things in ways they never could. And we have so many ways to do things now. As a researcher, I still see the need for simple drawings, to best illustrate certain features of insects. It just makes things so much more straightforward. Photography is great, but sometimes it takes away from what you want to see. It's just too much information sometimes. I don't think there will ever be a time when illustrations are not useful. CP: You've talked about computers, software, image analysis, is that what's going to bust us out and take us to the next level of scientific illustration? Basically, are we limited by the software, and as that improves, it'll improve, or are there other advances that you see for the media? JM: You know, some of the best illustrators today, those of the last 30 years, have gone from doing traditional illustrations to digital artwork. For example, George Venable, who used to work for the Smithsonian, used to do some of the most fantastic paintings and drawings. He later went on to doing digital images. He'd still draw the picture under the microscope, and then he'd scan it, and colorize it on the computer. Now we have stylus pads. I can actually draw an insect under my microscope with the stylus pad and the image will be right on the computer, where I can color and shade it. I can take a quick photograph of the insect, then I can select colors off the photograph and put them in the digital painting (to match colors). I can do anything I want to, really. Now he's [Venable] even going farther. He's taking the photographs, and then enhancing them, making the photographs look more like paintings. He moves the legs around, put shadows in, making it look more like artwork, but it's actually a photograph. So he's turned it the other way, but it's still illustration. So even with simple photographs, we can now enhance them artistically, add backgrounds, etc. CP: We've come a long way since the camera lucida, huh? JM: Yes we have, but we still use camera lucida type devices (especially drawing tubes), but they are much better now and easier to use! So what's going on in the future? I don't know. That's where color illustrations are going, but they are still expensive to reproduce. As publication costs go down, we will have much more color stuff. I think we'll always have black and white illustrations, because of their simplicity and usefulness. Where can we go? Well, we're already getting to the point where we can turn and rotate things around and have three dimensional images, on the computer, anyway, not in print. Where does it end? Where is it going? What can we expect in 20 years? Holographic images possibly? Or virtual reality. It's coming. Wouldn't it be nice to walk around a three-dimensional image of an insect whenever you wanted to study a part of it? Or pull a piece out, enlarge it, and study structures in increasing detail. CP: Like a "Trip Through the Trachea" or something. JM: Or whatever. Whatever you want. As the microscopes get better, the cameras get better, the resolution gets better, the depth of focus problems are dealt with. We have software to deal with that now, but it's not there yet. It's 100 times better than it was last year, but every year gets better. When you can take a picture of a bug, and everything's in focus...I don't know. It's amazing. The technology is what's pushing us along, and I don't see any real end in sight. Everything is getting faster with the newer computer chips. Wouldn't that be neat? Virtual reality, you could walk around and look inside the insects. CP: Virtual dissection, you can strip off layers of the bug, go deeper and deeper in. JM: And if you had some way to take a picture of the specimen itself, from different angles, you could put them in and compare them side-by-side. You could overlay them, all sorts of things. I don't know where it's going, but I picture it going that way. 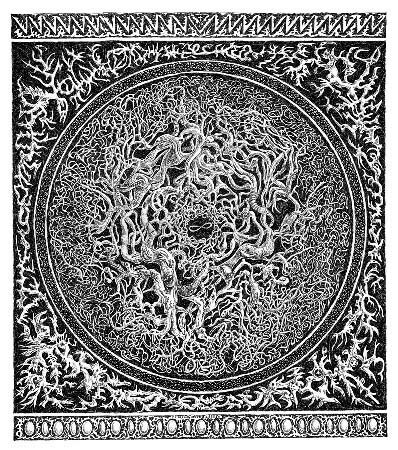 A scratch board is a white clay-covered paper board. Black ink is applied to the surface and portions of the black ink are scratched away to reveal the white below. It’s very handy for showing detail on a black background – ed.